It is blazing hot here in New York City. Like everyone else, I’ve been trying to keep cool and stay indoors, and I’ve been bemoaning the humidity. Still, there’s a part of me that is enjoying the languor and the torpor of summer. I have been slowing down this summer, a lot. Walking slowly, working slowly, writing slowly–even cooking more slowly and methodically than usual. It’s a choice. For the last year, my pace of life has been too frenzied. I’ve constructed a convenient narrative in which this is simply how things “have to be,” but it isn’t true; things don’t have to be frenetic and rushed and urgent all the time. My work is neither that plentiful nor that important. Only through slowing down have I realized that, in moving at an untenable pace, I’ve managed to hide out from a lot of things: people, memories, feelings. Myself, mostly. And it’s time to start pausing, so that I can listen to myself again, fully inhabit my body, and face whatever it is that I fear is lurking in the quiet. It’s funny: when I made the choice to do less and feel more, I thought it would be excruciating. I’m very good at typecasting myself, and, having assumed the identity of “Type A person,” I’ve imagined that quiet and rest and stillness are simply not for me. And, as is so often is the case, I’m happily surprised at how wrong I was. Slowing down has felt wonderful, so necessary and so right. I’m noticing and observing, then taking the time to write about what I see. I’m listening to music again. I’m reading for pleasure. And yes, I’m feeling all the feelings, too, which I guess is a mixed bag. A messy, unwieldy, disorganized bag. But if the cost of avoiding them is to slip into the automaton-like state in which I spent the better part of last year, then I’m happy with this tradeoff. If I can continue to feel small moments of joy and reverie along with some of the tougher stuff, then I’m happy to forgo whatever productive things and tasks I’m not doing when I’m being still. 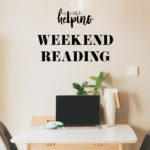 And one of the nice upsides of slowing down is that I have more time to read and to gaze at recipe inspiration, including the following links. 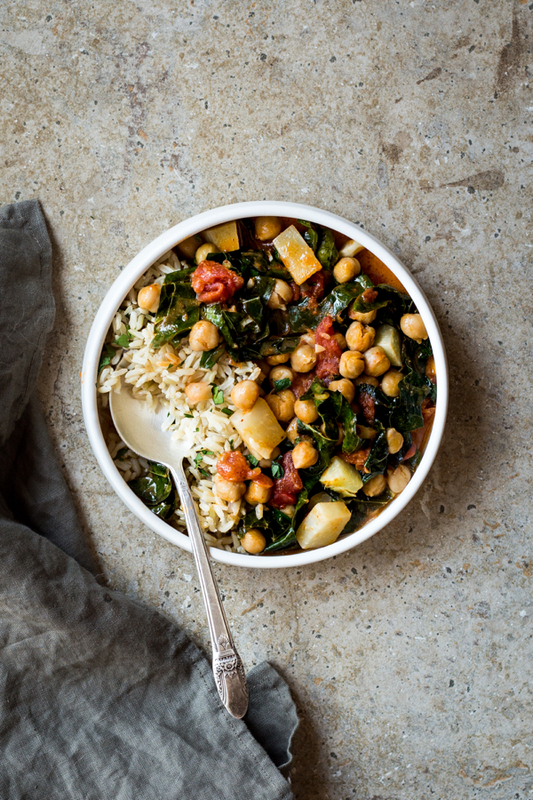 I don’t often use kohlrabi in my cooking, so I’m feeling inspired by Andrea’s hearty, flavorful kohlrabi and chickpea curry. Kohlrabi aside, I could make curry suppers pretty much any night, so this one is right up my alley. Substitute brown rice syrup or maple syrup for the honey here to make the recipe vegan (and in a couple of the recipes that follow, too). My anti-inflammatory turmeric tahini dressing is one of my all-time favorites, and I’m always eager to explore other salad dressings that feature this nutritious spice! 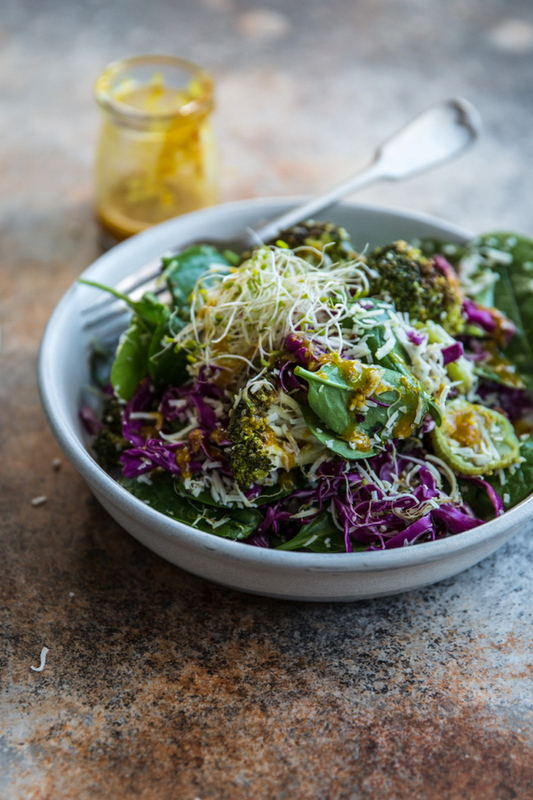 In the salad you see above, Sneh pairs roasted broccoli and coconut with crunchy cabbage and a sweet/sour turmeric dressing. Beautiful and complex. 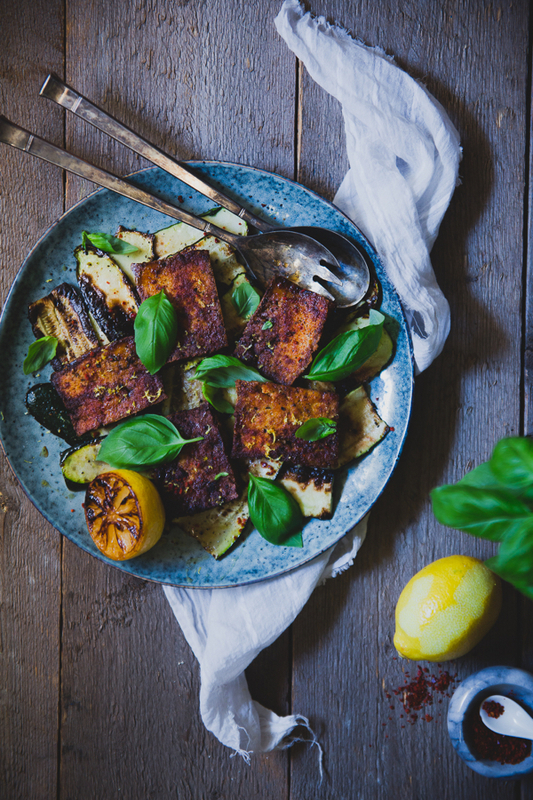 Most of us have seen avocado/tomato vegan caprese, but here’s a vegan caprese spin that’s so original and nutritious: Agnes’ zucchini and tofu caprese with grilled lemon. I love absolutely everything about this dish (not least the grilled lemon–yum! ), which would be a perfect appetizer for summer entertaining. 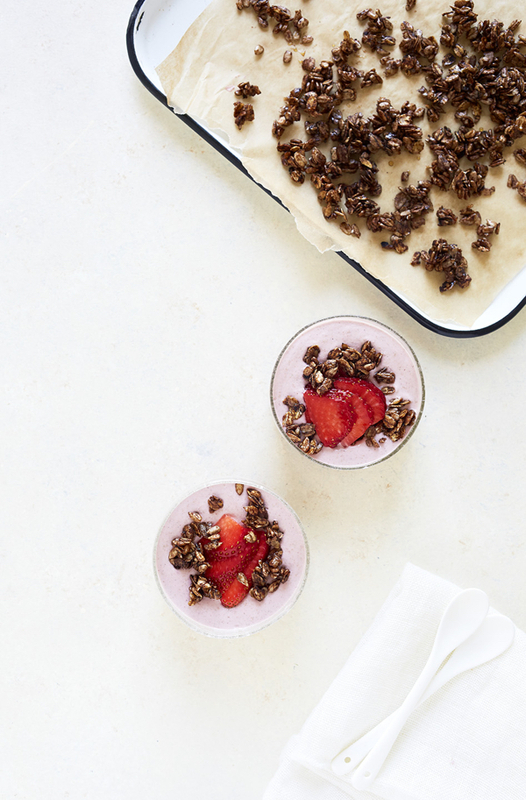 The lovely Julia has created a summer breakfast that combines a creamy, smooth strawberry porridge with crunchy, cocoa buckwheat crumbles. It’s colorful, sweet, refreshing, and absolutely perfect for hot mornings, when regular porridge just isn’t in the cards. And finally, a different kind of berry concoction: Tuulia’s mouth-watering gluten free and vegan blueberry pie. If you’re someone who fears pie-making, be not afraid, because this recipe features a short ingredient list and easy steps. Can’t wait to try it, or a version of it, soon. 1. To begin, I enjoyed this article about “the hummus wars” in the Middle East, a glimpse into how particular dishes and foods assume deep cultural meaning and significance over time (and yes, what you see above is actually a tub of hummus–weighing over two tons!). 2. This week, the New York Times called attention to a hunger crisis in the LGBT community. I hadn’t known about this issue, but as I was reading the article it made sense: employment discrimination, lack of quality health care, lack of family support and a strong personal network, and lack of access to the financial benefits of marriage can all contribute to food insecurity for L.G.B.T. people. A new survey suggests that about one in four L.G.B.T. adults have been food insecure within the last year, as compared to the one in six heterosexual adults who report similar circumstances. When asked the question, “Have there been times in the past 12 months when you did not have enough money to buy food that you or your family needed?” the differences are striking. Nearly half of L.G.B.T. African-Americans (42 percent) answered yes, compared with 28 percent of straight African-Americans. Among Hispanics, 33 percent of L.G.B.T. adults had been hungry, compared with 24 percent of those who are straight. Among whites, 21 percent of L.G.B.T. whites reported not having enough money for food in the past year, compared with 13 percent of those who are straight. Notably, among Native Americans and Alaskans, L.G.B.T. and straight adults were equally hungry, with about 30 percent each reporting that they had been too poor to buy food in the past year. The data is from the Gallup Daily Tracking of Adults, which surveyed 81,134 straight people and 2,964 people who identified as L.G.B.T. The article goes on to detail ways in which the L.G.B.T. experience may be glamorized or misrepresented in popular media, drawing attention away from these issues of access and marginalization. I think it’s important coverage of a topic that once again illustrates how food and health are so often intertwined with issues of justice and equity. 3. Along somewhat similar lines, a new article in Wired details some of the physical and health impact of racism, both overt and subtle. In fact, subtle racism is the focus of the article. While it’s difficult to parse the data, there is a distinct link between the experience of racism and episodes of depression and stress, and researchers increasingly believe that racism may have an impact on the risk for cardiovascular disease. 4. Much is written about self-esteem these days, but I was intrigued to read Aeon‘s recent article on the power and value of self-compassion. The article takes care to draw a distinction between self-esteem, which has to do with the way in which one regards oneself, and self-compassion, which is really a matter of how one treats oneself. Just as compassion involves a desire to minimise the suffering of others, self-compassion reflects a desire to minimise one’s own suffering and, just as importantly, to avoid creating unnecessary unhappiness and distress for oneself. Self-compassionate people treat themselves in much the same caring, kind and supportive ways that compassionate people treat their friends and family when they are struggling. When they confront life’s problems, self-compassionate people respond with warmth and concern rather than judgment and self-criticism. Whether their problems are the result of their own incompetence, stupidity or lack of self-control, or occur through no fault of their own, self-compassionate people recognise that difficulties are a normal part of life. As a result, they approach their problems with equanimity, neither downplaying the seriousness of their challenges nor being overwhelmed by negative thoughts and feelings. Life is fluid, evanescent, evolving in every cell, in every breath. Never perfect. To be alive is by definition messy, always leaning toward disorder and surprise. How we open or close to the reality that we never arrive at safe enduring stasis is the matter, the raw material of wisdom. If cultivating a greater capacity for self-compassion might enhance our resilience in the face of mess and disorder, helping us to navigate them with grace, then I think it’s a very vital resource indeed. 5. Finally, a heartbreaking article about mourning among pods of whales. That animals mourn their dead is not news to us (I think of Barbara King’s incredible book, How Animals Grieve, or Jeffrey Moussaief Masson’s When Elephants Weep), but to read about the small details of their process and behavior is still so striking. The article touches on a few types of grief, from the loss of a newborn (pictured above) to the loss of a compatriot or podmate. Reading this article, I wonder how it can ever be doubted that animals differ from us in degree and not in kind. With that, it’s Monday morning, and apparently this “weekend” reading is now post-weekend reading. Anyway, I hope you enjoy the roundup, and I’ll be back this week with a summery baking recipe! Dear Gena, So happy to hear you are benefitting from the riches of going slowly. It is an art that must be practiced mindfully, over and over, since it seems like we are under such pressure to rush through everything, as if our pants were on fire, for heaven’s sake! Bless you and your efforts, and may they bring you continued profound gifts. And thanks for these Weekend Reading gems. 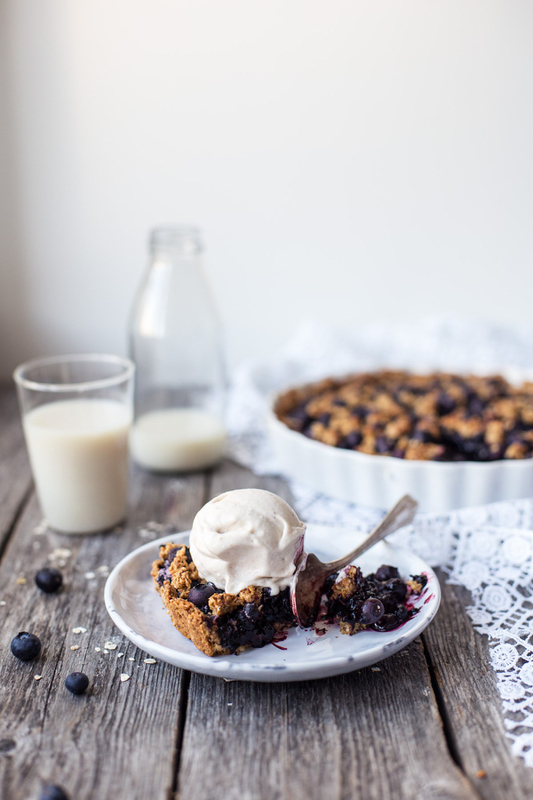 The ones that sparkled up at me were that blueberry pie–oh me oh my! –and the article on racism and the one on the whales demonstrating grief. In my new neighborhood in Portland I have been fortunate enough to get to know neighbors and friends of color and to attend workshops where neighbors come together to learn how to recognize and address “microaggressions” that are often the way racism is perpetuated. That these incidents affect the health of those who must live with them constantly makes perfect, sad sense to me. I hope we can continue tomove toward truth and reconciliation on this painful reality. The article on grieving whales put me in mind of an amazing young adult novel my friend back in Idaho Rachel Clark published recently called The Blackfish Prophecy. It is an amazing read for any age, and Rachel uses her training in biology and as a science writer, mother and activist for orcas to show us how complex the emotional lives of these intelligent creatures are. If you liked that article, I highly recommend the book. One thing I learned in it that this article reminded me of is how all the family members helping with a birth bring the baby whale to the surface so it can breathe and bond with its mother. That can’t happen in captivity in the way it needs to, and so the babies often cann’t imprint on their mothers and so don’t nurse, and die, thus leaving a grieving solitary mother with no support and no baby.. It’s unspeakably sad. Hopefully research like this will continue to awaken us to the reality of how complex the feelings of animals truly are. Thank you.